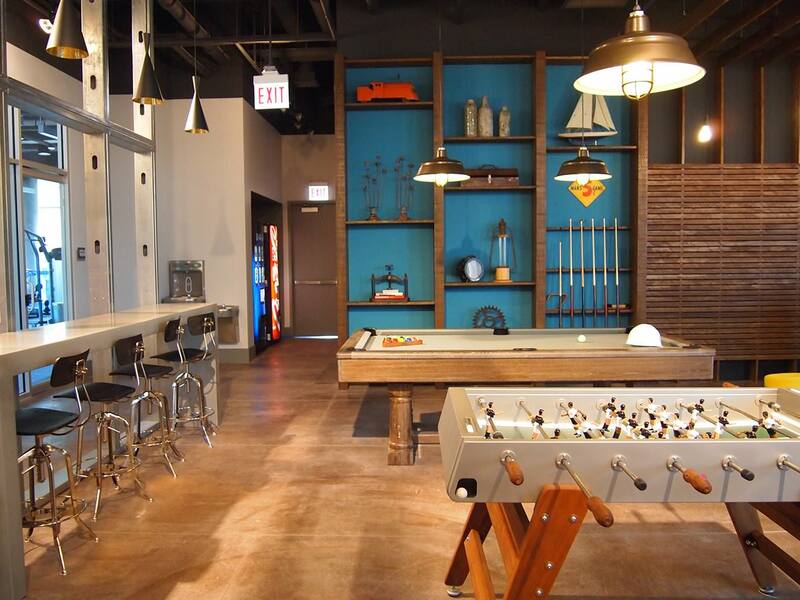 A stylish, upscale lifestyle development in Chicago’s vibrant South Loop neighborhood is redefining loft living with spaces that exude urban chic. The 398-unit property is comprised of two new L-shaped buildings connected by a ground-level walkway. The developer retained the design team to create amenity and common-area spaces that complemented the loft aesthetic of the apartment units. Exposed finishes, luxurious textures and patterns, and accents of color appeal to the target market of young professionals and families. The Club, a ground-level lounge open 24-7, is the centerpiece amenity. Custom concrete consoles reinforce the industrial aesthetic, tempered by warmth from chartreuse-colored seating and soft furnishings. The fireplace is surrounded by a coal-colored tile wall and a slat-wood treatment that rises from the floor and wraps the ceiling. The Cube, clad in glass imprinted with a vintage Alexander Girard design, is the focal point in the tech center. Light penetrates a screen wall, making dappled patterns on the concrete floor and glass wall of the conference center. A continuous wood ribbon comprises the counter supporting computer stations, and then flows into seating risers.